Submitting a Photograph with People in it? The purpose of Nim's Ocean Guardian Kid's Club is to encourage children to explore their natural surroundings to form a sense of personal connection to the ocean and/or watersheds in which they live. The Kid's Club offers children a stimulating opportunity to express their insights, observations and understanding of their natural environment through the creation of original stories, poetry and visual art. All K-8 students are eligible and encouraged to join! The club is open to all students K-8. Collaborative projects are accepted, but only a single Ocean Guardian membership card and packet will be presented. All submissions must be original work done by the child or children who register. All submissions must be received before May 30, 2008. All entrants will receive a Nim's Ocean Guardian Kid's Club membership card and, while supplies last, an Ocean Guardian complete membership packet. Limited quantity given on a first-come, first-served basis. Written poetry and short stories must be either typed or legibly written in ink. Poems should not exceed 32 lines in length. Short stories should not exceed 8 pages in length, and both require the use of 12-point font, double spaces with one-inch margins in Times New Roman font. The short story or poetry submission must be accompanied by the official membership form. Artwork should not exceed 11" by 17" in size. Acceptable media are: paint, pencil, markers, ink, crayon, chalk, acrylic or pastel (fixed), photography, cloth, and collage. All submissions must be done on paper that will allow for duplication, display or framing. Please, no notebook or typing paper, and do not mat, mount, laminate, frame or fold artwork. The artwork submission must be accompanied by the official membership form. Children's names and addresses will not be shared or further distributed. 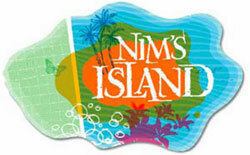 This information will only used for Nim's Ocean Guardian Kid's Club announcements and activities. Photography submissions that include identifiable individuals must also include a signed model waiver form. See below to download the appropriate form. Through submission of original work, students and their legal guardians grant NOAA National Marine Sanctuary Program and Walden Media non-exclusive reproduction and publication rights to the work(s) submitted. 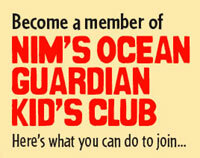 Download Nim's Ocean Guardian Kid's Club official membership form. Reduce waste and dispose of trash properly. Reuse or repurpose products to extend their usable life. Recycle disposable items and use products made of recycled materials. Be considerate of ocean wildlife and seabirds. Clean up the beach, park, or river and leave it better than I found it. Devote time every year to community service to benefit and beautify the environment. Increase my own awareness of the effects that I have on the ocean and our environment. Learn all I can about the environment, including special ocean areas like national marine sanctuaries. Promote ocean awareness and pass on my knowledge to friends and family. Encourage my family and friends to protect the ocean and our environment.